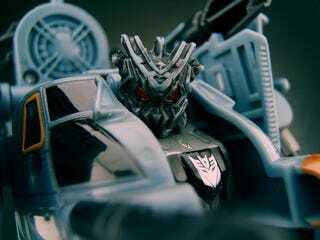 Transformers Toys For Tots: Barricade, Brawl, Jazz And...Wreckage? Well, it's Friday and we're feeling a bit of a hankering for some Transformers action, and our fave fan-boy site on all things 'formers is all about the toys today, scoring not only pictures of the Pontiac Solstice-bodied Jazz, the Saleen Mustang-bodied Barricade and the Abrams Battle Tank-bodied Brawl — but also some pics of a not-yet-seen and until-now not-yet-named Decepticon by the name of Wreckage. Wreck-Gar? No — Wreckage. We've no idea what he is — although he does appear to be some kind of military vehicle like an armored personnel vehicel. We've also no idea what his role in the movie will be, but hey — good find on TFW2005's part. But that's not all we've got. We also managed to snag some clear-as-daylight PR pictures of the toy version of the Decepticon baddie known as Blackout in all of his MH-53 Pave Low blade-filled glory. The Transformers in a box gallery, sans Adam Sandberg and Justin Timberlake is first and the Blackout gallery is below that. And with that, our craving for Transformers tchotchkes has been satisfied for the moment. But if yours isn't, feel free to check out or tag page and our gallery for more to get your fix.